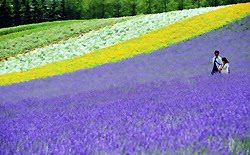 I saw this at the Mainichi site: a field of flowers in the Furano Basin in Hokkaido. The article says that there are about 60,000 lavender flowers, and when the pleasant wind in the northern part of the country blows, the poppies, lavender, and baby's breath flowers sway in the wind. The article also says that the earthquake that Japan experienced this year has caused tourism to decrease, but during the current season, there tend to be several tourists from early in the morning on weekdays.